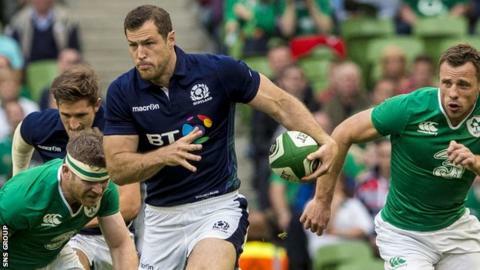 Tim Visser says Scotland are in great shape and good spirits as they prepare for their World Cup journey. The Scots open the tournament against Japan on 23 September and the Dutch-born winger is raring to go. "We're in tip-top shape and everyone is as fit as they've ever been - once the games come round that's when I start to thrive," Visser told BBC Scotland. "It's been a long journey for me that started just after the last World Cup and we are finally here." This will be Visser's first taste of the World Cup since he became eligible to play for Scotland in June 2012, having spent the previous three years with Edinburgh. And he revealed there is some interest in his participation for Scotland back in his country of birth. "Rugby is a small sport [in the Netherlands] but for the first time a Dutch TV station have acquired the rights to broadcast the games," he explained. "Football is always the number one sport but after Holland losing recently to Iceland [in Euro 2016 qualifying] attention now turns to the World Cup here." The 28-year-old, who agreed a summer move to Harlequins, thinks a tournament so close to home will aid the Scots. "We are now getting on a one hour flight rather than a 40 hour flight to New Zealand like last time around," said Visser as the squad assembled at Edinburgh Airport. "It's great that we can get all the last minute preparations done here at Murrayfield. "Once the France game finished last week this is everything we have been looking forward to. "I woke up this morning with a big smile and even had Sean Maitland singing in my room!" And what was the choice of tune? "Rhythm is a Dancer," Visser answered. "And really slowly as well... It was a bit weird!" Following the opener against Japan in Gloucester, Scotland take on USA in Leeds before the final two pool matches against South Africa and Samoa take place in Newcastle. Visser is sure the Scottish fans will turn out in large numbers to support them given there are few travel issues to overcome. "I think we will have a lot of support there especially for the Newcastle games," he explained. "I'm expecting a lot of Scots to come down. The way we have been playing is exciting. The improvement has been immense especially in the last couple of games."